I love my family. I have so much to be thankful for! Here are some snippet's from our day yesterday. We took a small road trip to see some of the beauty right outside our backdoor.. and then of course there is the even more important beauty I have the pleasure of calling my children. Thank You Jesus for the beauty that surrounds me! One of my very best friends has a little boy with Autism. His name is DJ. 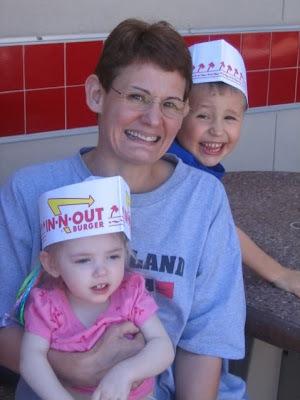 I met Michelle, DJ's mom, at the Ronald Mac Donald Resort and Spa when Makenzie and I were in AZ for HBOT. It took a few times passing each other in the kitchen before we said hello and man am I ever glad we did! We were both exhausted, sad, and not really in the right emotional place to be making new friendships. For some reason however, we did. Michelle kept me sane. She took away the sting of loneliness and missing home. She was and is a true gift from God! We have talked everyday since the day we met and have taught and learned so much from each other! DJ walks, talks, eats, and is potty trained. He is very smart but yet very broken! Makenzie can not do any of the above but she does make eye contact and has very good receptive language. DJ does not. These two children and our friendship have taught both of us that disabled is disabled no matter to what degree. Each child is so different but in the end the heartbreak and loss over lost dreams and the broken heart is the same! On the other side so is the joy for any bit of progress large or small. Our children are polar opposite but yet we get each other. We can laugh and jump for joy over our children's successes and we can cry with each other when life is hard! Michelle has fought so hard for DJ. I have known DJ for 3 years and he has come so far! It didn't come without a ton of hard work both on his part and his mommy's. Michelle is also any amazing writer. You can find her blog here. Last night she wrote a wonderful post that made me cry! I asked her if I could re post it on Makenzie's blog and she graciously obliged. So here it is! Enjoy!! I must admit that I am an Olympics junkie. There is something astounding about these athletes that have trained and sacrificed so much for one goal.......to be the best! I can't even imagine giving up friends, school , and even family to train as an elite athlete. Then you have their families........what have they given up to fuel the dreams of their children? Some have done without for so long......while others have worked two and three jobs to finance their young hopefuls.........It really is almost overwhelming. However, I got to thinking tonight that we parents of Special Needs children really aren't much different. I have traveled great distances, spent weeks away from home, quit my job, spent endless hours researching treatment, hours of therapy, hours giving therapy, and heartbreaking times fighting for my son. Why, because I believe in him.....I believe. We parents will probably never be featured on national television, and our children won't be gracing the pages of Sports Illustrated. Still, we press on....some of us trying to teach our children to walk, talk, eat, or learn to be human. Daily.....all around us these struggles continue. Our medals are not Gold or Silver, they are smiles, tears, and triumphs for things most parents take for granted. I never realized that I am an Olympian. Not a sports figure.....but in spirit because I believe that with tremendous hard work and effort AND faith.......my son will have a future! I carry my torch daily with so many of my special friends with special children. If you know one of us......give us a congratulatory hug......our journey is long and for some of us it will never end....but we believe and we have faith! All we ask for is a little encouragement......our finish line is often far away and we need to hear the cowbells and cheers to push us along the way! I want my motivation back! I do not know what stole it and I am not sure when but I want it back. I constantly say to myself that life is going to slow down soon but it just doesn't. I am pretty sure that it wont anytime soon. To some degree I am ok with this busyness because if I wasn't busy I would be bored out of my mind. I need some balance. If I take time for myself my house goes to the birds, if I don't take that time however I feel subhuman. I need some balance. If I do everything that Makenzie needs in the evening the boys don't get what they need from me, but if I don't do Makenzie's night time routine she is out of sync and doesn't function as well the next day. I need some balance. If I don't go to bed on time I feel like a train wreck in the morning and tired through out the day, but if I go to bed too early I don't get enough peace and quiet and I feel like the walls are closing in on me. What it all boils down to is that there is about 5 hours too few in a day. We all need balance between work and play. This for me is the hardest part about taking care of my very special child. For almost 3 years now I have been juggling this balance. Kids, therapy, house work, me time, school activities, sports, and not enough time. Sometimes it is easy...smooth sailing, some days it is hard....almost too hard. Tonight as I threw the balls in the air and started to juggle the dishes and laundry there was mysteriously no water. No big deal right... I didn't want to do them anyways right? I really didn't, but then I had to juggle some more because a few minutes later a guy from the water company came to the door and told me that it would be a few hours before the water would be turned back on. CRAP! No biggy right.... other then the fact that I still needed to make Makenzie's formula. For that I need WATER! Juggle, Juggle, Juggle, Juggle! Tonight I feel like I am about to drop all of the balls. I know that I wont but it sure feels that way right now! So tonight I will fold the laundry that is already clean, pick up a bit and know that tomorrow is a new day! There are times when the troubles we face seem overwhelming and when the future seems to hold no hope. Thank you for this reminder that what we are facing in this day is quite small and won't last very long compared to the immeasurably great glory that will last forever. Thank you that you have made a way for every member of this family to tap into your everlasting glory. Thank you that your love transcends our present struggles and will carry us through. And thank you, Lord, that because of Jesus we are able to tap into that everlasting love and glory even today. Lord, I ask that each of us in this family would experience a touch of your glory today, and find a new sense of perspective and hope in the immeasurable glory to come! We started therapy at 8am with speech. It was a great start to the day! Makenzie worked on her colors and then she started making 2 color patterns! WOW!!! She colored a butterfly on the computer. Her therapists is going to print it out and bring it next week! Go Makenzie! PT and OT was also great! They got her rib cage to move with some rotation which is really great! She was so happy and loose when they were done! I had 35 minutes to run to Target, get a script, return and item, grab Makenzie some lunch, and get my oldest black pants and a white shirt for his orchestra concert. I made it and was only 4 minutes late! When we got home Makenzie's feeding therapist was waiting. Turns out I didn't need to get lunch because Lyn had brought Fazoli's. Makenzie ate spaghetti, a bit of a bread stick, cheesecake, and a few sips of my cherry coke. She did great! It still amazes me that she is making so much progress with eating! Ok now it was back into the car to bring Zach's clothes to school and then back home. Zach's concert didn't start until 7:30pm so I started Makenzie's feed and put her in bed for a VERY rare nap! She slept GREAT! It is a good thing she did because we didn't get home until 9:30pm. Bedtime for Makenzie is normally 6pm! Mommy spent the duration of the said nap cleaning up so that there would be less to do tonight. I got Makenzie up after napping for over 2 hours and into the bath, dinner, and back into the car for an orchestra concert treat! Zach's concert was amazing! I wasn't sure if he would like playing an instrument but he LOVES it! He is really good and I am SO VERY proud of my son! Here is a short video of 450 kids playing in this orchestra composed out of middle school kids from 9 different schools! They all did so great! The night was not over yet though,there is always a trip to Dairy Queen after stuff like this in our family. I am sure this whole post was TMI but it was my day and right now I am too tired to be witty and creative. I am just glad it is done! There were only a few things that I should have done today that didn't get taken care of but such is life! Stem Cells are less then 2 months away away! KEEP PRAYING!!! If it isn't preschool drama it is grade school, or middle school issues. I was told one time when my kids were little, parenting got easier when your kids went to school. Yeah.... they were LYING!!!!! I am trying to stay up to date with everything that is going on but between all of Makenzie's stuff, and 3 busy boys it gets a bit hairy sometimes. When I was in middle school my whole school was one hallway long with double doors that led into the high school. We had lockers without locks, and we were aloud to carry backpacks. My son goes to a school that is as big as a mall...maybe that is a bit over the top but you get what I am saying. He is one of over over 1000 kids. A locker with a lock that still takes him forever to open, and there is no back pack wearing aloud. I can't relate! I have no clue what it feels like to be him and that drives me crazy! Then there is the bullying by students, and the teacher induced humiliation which has me very concerned. Then there is the lack of communication, and the language that I have heard coming out of the mouths of babes, when I have been there. Trust me, I know that the world is mean, I know that we can't live in a bubble, I know that we will have people that treat us unfairly, and friends that don't last. I know there will always be disappointment and failure but where do you draw the line with your kid, who has already been through so much. When do you call uncle and just protect no matter what anyone thinks. I am very close to that line! I spoke with the Vice Principle tonight. I voiced all of my concerns and she thanked me for calling and told me that everything I had reported was unacceptable and would be addressed. I have an appointment with her on Monday along with parent teacher conferences. Pray for this mommy to stay calm....at least until I get back to my car! This school is a good school and my son is getting a good education. Just concerned. Makenzie.....well... she had a GREAT day! She had some good therapy and after they left she and I laid on the floor to play. It was another close the blinds kind of moment but I will open them for you all.... LOL!!! Watch this one minute of AMAZING!!!! She rolled ALL of the way over two full rotations about 3 times! This video was taken at the very end and she was getting bored with our game. Then I took her to school and her special education teacher told me that she was doing a great job learning her colors and then her report after school read that they matched colors today! What a smart girl!!! She is doing so well in Pre school.... she finally is adjusted, she finally has a way to communicate, she is finally learning something. I asked the school for a registration form for next year. I talked to the receptionist for a bit and according to her....even if I pay for her to go to school next year they will not allow her to be there because she will be 5. They have removed EVERY SINGLE form of parental discretion. Other then a private school...which I have yet to find one that will take Makenzie,,,,, I have no way to hold her back. Not even if it is for all the right reasons! Yeah, to say I am sick of school issues would be an understatement but I plug on! Tonight as I was hanging up the phone with the Vice Principle she said to me "dont loose hope...we will work all of this out?" I responded with " Hope is some that I will never loose, there is a lot of that left in me!" So I continue to stand in God's Hope and Grace!!!! Where in the World is the Wheat Bulgur? "Are you feeling guilty for letting your dirty laundry pile grow to the size of Mount Vesuvius? Overcome with shame because you can hardly see your computer screen through the greasy fingerprints and you just don't care? Well, don't be! Not Me! Monday was born out of my desire to admit some of my imperfections and reveal a few moments I'd rather forget. You may find it therapeutic to join in and do the same thing!" For more Not Me Monday check out this site. So this week flew by! I still can't believe it is Monday again. I thought it would be fun to let you in on some more of the comical moments in my life. This week when I ran across the menushoppers.com web site it was not me that took the list straight to the store with out even looking at the recipes all of the ingredients made. It was not me who didn't really even care what type of food I would be eating this week because I didn't have to think, or plan, someone else had already done that for me. Nope not me! Then it surly wasn't me who looked at that list to realize that I had no clue what Wheat bulgur is. Do you? If you were a health nut like me you would surly know. Yeah, well then I definitely didn't go straight up to my computer to google it before leaving for the store. Only to leave Wal Mart with out the mysterious bulgur after looking for that one item for over 20 Min's and asking three employees who all looked at me with the same blank stare. When I got home there is no way I was going to attempt making one of the meals on the list.... no way. When looking at the directions it was not me who had to go back to the beloved Google to figure out what the heck a jelly roll pan was! Yeah not me. Cause me.... I am a good cook who has dinner ready from scratch every night by 5pm! Then today when Makenzie thought mommy was really funny as she was stomping down the stairs, I absolutely did not shut the blinds so my neighbors would not think I was insane while I ran around my living room like a maniac, stomping, jumping, and singing, all so that my daughter could have a good laugh and practice rolling from one side to the other! Ummmmm no! Dinner tonight was great! Why?...of course it was because I made a good home cooked meal and not because I agreed to watch one of my friends kids until late tonight only after she offered to bring dinner! Remember... I LOVE to cook! I would never rather watch 2 extra kids until 11pm. LOL! Dinner for Makenzie was even better. It was not me...maybe her grandma, that fed her Rocky Road ice cream and Cheetos for dinner. I would never do anything like that! She did a really great job eating and asking for more though! Its a good thing Makenzie eats for pleasure and gets formula at night! Clearly, as you can tell by the pile of laundry in this picture, hiding in plain site, it is also not me that is still way behind in this department! Hey, at least the kids were having a good time! Makenzie loves to watch her brothers play video games!!! So cute! Aside from the comedy, today was a great day! Makenzie was super happy and did a GREAT job rolling and laughing. She also ate and vocalized what she wanted wonderfully today! I met another special mommy today and had a great time sharing Makenzie's story and hearing her story about her beautiful little girl! God is good! Thank you to all of my special friends and prayer warriors for being there during the good and the hard times! Please excuse my construction! Same site new look!!! This morning we woke up to MORE snow! I am now officially sick of winter! Despite the snow I loaded all of the kids up and headed to church. Then it was to the mall to do a bit of shopping. My friend came and picked the boys up from the mall and took them home. So Makenzie and I had a girls shopping afternoon! Fun stuff.... well it was until we hit the third or fourth store in the outdoor mall....in the snow! On the way home we picked up some food to feed the brood that was awaiting us. I got spent the afternoon with one of my good friends. The boys spent a good portion of the afternoon building a snow fort in the back yard and the rest running circles around the house! Did I mention I am sooooo sick of winter?!! Tonight once again I am so overcome with joy for the progress Makenzie has made and continues to make. Makenzie may not be sitting or walking but she is come so far in many, much more important, but less visible ways to the untrained eye. Again tonight she did not want to go to bed. She whined in the bedroom, so I turned around and walked out the door and she stopped. As soon as I went back to the bed and laid her down the screaming began. This is just the most heartwarming thing...knowing that she gets it! She is in there. I have known this for a long time but she physically shows it more and more every day! As I laid in bed with Makenzie, in the dark silence, I was overtaken with emotion. She belted out her part of Jesus Love Me. She told me I love you. I asked her if she was going to get down and she rolled of of my chest and onto the bed. I laid there for a moment, in the still and quiet waiting for Makenzie....I wasn't sure what I was waiting for... but I waited...and I am so happy I did. She looked at me, smiled, and reached out her beautiful little hand and laid it on my cheek! TEARS!!! I just love that girl!!! Overwhelmed with Joy! What a GREAT day! Makenzie started the day in a fit of laughter when her brother walked into the room to say good morning. What a nice way to start the day! We finished up another intensive round of ABM today. I have lost count on what number this is but she continues to make improvements. The biggest thing I have noticed from this session is the movement increase in her arms and continued improvements in her oral motor skills! All great stuff! Another amazing thing Makenzie has been doing very consistently is identifying people by name with an eye gaze and smile. Tonight when I was getting ready to put her to bed she could hear Josh in his room. From where we were standing he wasn't visible to the eye. I asked her where Josh was and she tried to find him looking a bit confused. I then told her that he was in his room and she turned, looked right at his doorway and smiled! New, New, New, and just AMAZING!! She also had several good temper tantrums this evening! I think this is also great! I know I am strange but I love to see Makenzie's personality! Some things just didn't change! I told her is was time for a bath and took her upstairs. The second that we hit the bedroom she started just a wailing! I asked her if she wanted to play with her brothers and the waterworks changed instantly to a huge smile! Can you say spoiled?! I told her we had to take a bath first and then she could play with her brothers when we were done. I laid her on the bed to take her clothes of and the waterworks started again. I called my youngest in to distract her and once again... water works off... smile on! Then it was into the bathroom same story and again when I laid her down to sleep! Oh, does she ever love her big brothers! Oh, do they ever love her just as much back! What a great day! Tomorrow is going to be crazy... so much for Sunday being a day of rest! Oh well! Thanks for all of the thoughts and prayers! Please keep praying for our current fundraiser! Pray that God would bless us with the means to get Makenzie to Costa Rica again!! There is less then 2 months until our scheduled flight into the San Jose airport takes off! Please also pray for our trip to the ABM Center next month! We have a busy couple of months ahead of us but I am so excited! 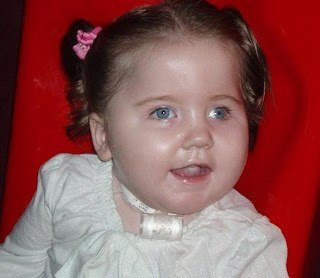 Makenzie has improved so much since the first Stem Cell treatment and the start of ABM! To find out how you can help, how Makenzie has improved in the last 6 months, or what you can specifically pray for, please click HERE. Please pray for continued healing and restoration. Makenzie just continues to amaze me! She had two great ABM lessons today. Makenzie is using her hands and arms so much more every day! She continued to knock the ball off of the table today more with her hands then her feet! In PT she stood..with help supporting her hips... next to a table. We put a toy piano in front of her and asked her to push the buttons. She did... over and over...while supporting her body in a standing position! It was so cute and she was so proud! Just thinking about her doing that makes me so overwhelmed! I remember when she didn't move her arms AT ALL! Just amazing! Watch out world here Makenzie comes! She was also able to hold onto the ropes on the swing all by herself! What a big girl! Tonight Makenzie and I headed to Walmart to get groceries. Normally I don't shop there. In fact they totally redid the entire store. I had to ask where the hair stuff was because I honestly had no clue where to look! I asked the associate when they had redone the store and she responded .."august"! Yeah...its been a while! Why then, you might ask, did you choose to go there? Because, that is where menushoppers.com told me to go. I found their site after watching a news segment and I thought I would give it a try. menushoppers.com provides six recipes a week for dinner meals. Then on top of that they research the best non coupon deals at several stores. Wait there is more... they offer an ordered list complete with the price of each item to make each of the 6meals for the week. Could it get any better then that....yes, yes it can... they claim that everything on the list for an entire week of meals for 4 people will cost $75.00 or less. Now that is a language that I can understand! So we tried it. It was true. I bought a whole weeks worth of food... including milk, cereal, snacks, bread, fruit, and juice for under $100.00... WOW!!! Now we will see if the recipes are any good. I made one tonight and it was a hit. So far so good! Our Saturday will involve 2 ABM lessons. I hope to get a few other things done as well but who knows... I am hoping for a bit of time to unwind as well! Time to call it a night! 8am on a Saturday is going to come way to soon! Last night I made the mistake of watching a video before going to bed. It was about a little boy that survived a near drowning. He looked just like Makenzie did after her accident. Breathing tube, IV's, half cracked, glazed over eyes. That same little boy less then 2 weeks later was up, sitting, walking, talking, eating, fully healed. At home.... normal. For that family this is amazing. My first reaction however was why? Why him and not Makenzie. What did they do right that I did wrong. Do I not have enough faith? What is God trying to tell me? What does He want me to learn? I don't get it. I was talking to a friend of mine who walks the same path of brain injury. We were both honest with each other about how it made us feel. STUNNED! When I layed down last night, Ihad it out with God. I pleaded for healing, peace, and understanding. I asked what He wanted from me. I asked Him why this happened and why He choose another family to bless with the miracle of full healing and not my family. Of course I don't think I will ever know the full answer here on earth. I got to thinking about everything that I would not have if God had fully healed Makenzie 3 years ago. There is too much to list. However, as the selfish human I am, I would give it all up in less then three and a half seconds if Makenzie could receive full healing. What God did do was give me peace. He renewed my confidence in His plan for this family. He gave me strength and hope through that little boy. I saw a miracle! I see many miracles everyday in Makenzie. God IS the mighty healer. I know and believe that a full healing is not out of reach for my princess! Not out of reach at all. I laid down next to my beautiful daughter. I watched her chest rise and fall with each breath. I looked at her perfect fingers and toes open and relaxed. What a little miracle! MY MIRACLE! With God all things are possible! Believe that with me! This is life after tragedy. It is a short lived pity party. None of you were invited...sorry about that! It is confusion and grief. It is the constant reminder that life isn't fair.... for ANYONE... not just me. Every once in a while something pops up that just knocks me off my feet and onto my knees. When I fall... God is ALWAYS there with me. He ALWAYS picks me up puts me back on my feet. He grabs my hand and continues to walk down the road by my side, carrying me when I can't walk anymore! God is Good! Today was a great day! I am blessed. Who is ready for a real party? It is coming next month! 3 years ago March 25Th God gave Makenzie the gift of life for the second time! Now that's a reason for celebration! Wednesday's are crazy. From 8am until 1:45pm Makenzie has some type of therapy. Then some weeks throw in ABM after the normal craziness. Last night I noticed that Makenzie's right leg was bothering her again. This leg give her irritation from time to time. Don't really know why but it really stinks when it does. Neither her PT or OT are terribly concerned and she did well today in all therapies! Her right hip could be the root of the issue but her PT still feels that it is seeded correctly and we are still keeping a close eye on it. Pray for this to feel better and that God protects the integrity of Makenzie's body! She is doing so well! We had a special treat today when Makenzie's feeding therapist brought ALL of us lunch! Makenzie ate SO well. Every week the report gets better and better! Her oral motor just continues to improve by leaps and bounds. She is closing her lips more and more and her swallow is so fast and strong! Go Makenzie! This afternoon was also a bit eventful due to a gas main break down the street from our home. They wouldn't let kids or traffic through so I had to go pick the kids up from 2 different schools along with several extra kiddos that couldn't get a hold of their parents to come and get them. the kids are in bed....check, the house has been picked up....check, American Idol has been watched.... check, and now my blog has been written.... check. Guess it is time for me to get some sleep .... we shall see if it really happens! I say this every night.... and every night I get into something that keeps me up way to late! We shall see if tonight is any different! LOL! ABM went well today! I could listen to that laugh all day long! The really cool thing is that her laugh has been changing. It is so much less raspy and so much more vocal. She gets to laughing so hard she gags and I am just sure she is going to hyperventilate! Sorry the quality of the video is not the best but of course I didn't have my camera so I took it with my phone. Makenzie is really starting to use her hands and arms! It is so cool to see! If you notice in the video not only was she kicking the ball but she was actively pushing it as well. She is using a lot less flextion when reaching which is GREAT! She just amazes me! Other then a messy house life is so good. I have a lot to be thankful for and a ton to look forward to! Another crazy day filled with PT, OT, Speech, and feeding therapy, tomorrow! "It is quite refreshing for me to admit that I am not super mom, while still hiding a little bit behind the guise of Not Me! I hope you'll consider joining in this week yourself." I have never done this before but in my exhaustion the last couple of weeks I have had many "Not Me" moments and I thought that it would be fun to share because I am not super mom either. I am just trying to survive life with 4 kids and special needs! During Makenzie's second ABM session I was just focusing on her and not trying to write a fundraising letter.. nope not me. I surly wasn't going to bring my computer with me to a session to work on that letter. Nope not me. After getting half way into downtown on our way to the appointment, where I was not going to work on that said letter while Makenzie had an ABM lesson, I didn't have a panic attack thinking I had left my computer on the front porch... not me... no way! Then it surly wasn't me who turned the car around causing Makenzie to miss ABM only to get home and find my computer sitting safely on my desk. Nope not me! It also would not have been me who washed the same load of laundry 3 times this week because I got too busy or just plain forgot I was doing laundry. Not me.. who has four kids and forgets they are doing laundry? Not me! Then today it wouldn't have been my kid that kicked his shoes off at the door sending one flying into the carbon monoxide detector causing it to go off blaring the most horrible sound all through out the house. Oh no... not my kid. He also didn't take that same alarm straight out the back door and throw it into the snow. Nope! There is no way I yelled at him for throwing the $50 alarm into the snow and ruining it. Nope not me. I didn't take it back out of the snow into the front yard to try and get the blaring alarm to stop without success, only to snap the button on the front off. Ya know the piece that lets you reset it. Nope not me. Still blaring in my ears, there is no way that my neighbors came out to see what the heck was going on. My life is NOT that comical! It was not me that had no clue how to make it stop. I could feel myself going deaf. So is surly wasn't me who ordered my son to go find a hammer. He wasn't at all excited to be told to demolish the loud, beeping, neighbor gathering, box. I would also be lying if I told you that it was silenced after only one quick swoop of a metal hammer! AHHHHH silence. Makenzie continues to do so well. All of the chaos in my life is so worth it. At the end of the day when I lay down with her,all busyness just fades away! I look into her eyes. WE sing Jesus loves me. Yes Makenzie sings with me... it is the cutest thing ever! I tell her I love you. She tells me I love you back in her own sweet little voice and way, and I lay her down to drift off to sleep! She is SO WORTH it! Thank You Jesus for giving me all four of my kids! Chaos and ALL! Today was probably the best Valentines day I have ever had! We made it to church this morning. Finally! It was a great service! Then it was out to brunch with my four precious valentines, my mom, and dad. The boys were not as well behaved I would have liked but the food was great and I left fat and happy! Makenzie ate a good amount of cottage cheese for brunch. It feels so good to order something for her to EAT!!! LOVE IT! Amazing! We got the house picked up, laundry folded and put away, and rooms clean! Makenzie did very well this evening rolling around! She is just so proud of herself! We start another round of ABM on Tues and we are 5 weeks away from the ABM center in CA!! So exciting! My kiddo's and I spent the day loving each other and just being together! Worshiping, eating, playing, and getting the house in order to start a new week! So what can I say....we had a pretty dang perfect day! Amazingly I did get to sleep in this morning! It was GREAT! I told the boys when I got up that today was my day off...hahahaha... their job was to not make a mess and to get along. They did a pretty good job. Makenzie woke up about 1:30am this morning with a very stuffy nose. This morning however she was just fine! Who knows but I am glad that she is not sick..... other then pink eye! Yes, yes.... oh well. With 4 kids pink eye is easy stuff. By Monday it will be all but gone. We got a package in the mail today for the 2nd day in a row. I love surprises. Well, most surprises anyway. Yesterday we got a package from Granny Kay and Papa Pat with some very cute jammies, clothes, and valentine's candy! Today Makenzie got a blanket from Jaxsons Blankies for Babes I is beautiful They made it with material that had Elmo, and all his Sesame Friends! Makenzies FAVORITE!!! Thank you so much! Here is Makenzie in her new jammies with her blankie! It is official. We are going to the ABM center March 22nd. I can't wait! Andrew is going with us which will be wonderful company and he will get to see Anat work with Makenzie first hand, ask questions, and get ideas and consultation on specific things to work with her on back home! I can't wait! 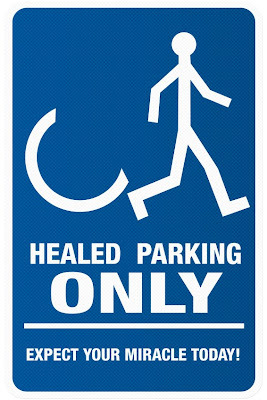 We are going to start another intensive On Tues. Pray for healing! Makenzie continues to do so well! Keep Praying! As many of you know, in July of 2009 we traveled to Costa Rica. While there, Makenzie received Stem Cell therapy to assist help repair damage caused by her anoxic brain injury. We had high hopes that God would use the new cells to bring healing and restoration to our little girl. We were told that improvement could be seen anytime from immediately to about three months post treatment. We never realized how amazing Makenzie’s healing would be in the coming months. Upon returning home, we began to notice small improvements in Makenzie’s ability to hold her head and trunk more erect. As time progressed, we noticed that Makenzie was responding faster to directions and was not getting stuck in her flexion pattern as much. She also began to track moving objects in all directions much faster and gained the ability to look up. Three months post Stem Cell therapy we attended The Napa Center for a three week intensive therapy session. At this time, Makenzie began to eat! Her oral motor skills had improved immensely and her swallow was fast and strong! Shortly after this, she also began to sit independently for up to 5 minutes and learned how to put herself to sleep allowing more quality family time. Another major improvement has been in Makenzie’s immune system. This entire cold and flu season she has only gotten a few minimal colds. Not one time did she require a formula decrease or hospitalization. I have also had the realization that Makenzie is not having her normal vomiting episodes two to three times a day anymore! In fact, she has not vomited since we returned home. All of Makenzie’s doctors, therapists and teachers are astounded by her progress. Her rehabilitation doctor has stated that her tone is better; she is more animated, has more personality, and is interacting and vocalizing much more appropriately. After Christmas we began the Anat Baniel method with a practitioner. With ABM they have found it often possible to directly communicate with the nervous system of children in very gentle, yet powerful way primarily through movement, enhanced awareness and non-verbal kinesthetic experiences. The practitioner of this method uses gentle, innovative techniques to help the brain of the special needs child form new neural connections and patterns that take the child beyond their current limitations. The Anat Baniel Method for Children (ABM) is scientifically based and the results have been validated by medical doctors. We have now completed two intensive ABM sessions. Makenzie is now rolling more, moving more, using her arms and hands to access toys, saying a few words such as “hi”, “go”, and “yeah” and she is following specific directions in order to complete tasks on her own with the talker. Her teachers at school have noticed a huge change in interactions with her peers and have reported Makenzie is using many more sounds to communicate. After seeing all of the amazing healing that these therapies have brought Makenzie, we have planned a trip back to Costa Rica in April 2010. We would also like to take Makenzie to the ABM Center in California to work directly with Anat Baniel for several weeks this year. Our hopes and aspirations for this year include decreased dependence on her feeding tube with increased eating by mouth. Pushing to and sitting up independently along with some form of independent mobility through rolling, scooting, or use of a walker. Finally, we would love to see improved communication using both her talker and spoken words. While we are planning to personally fund a significant portion of the expenses, we will fall short of the estimated $25,000 necessary for the Stem Cell therapy, ABM therapy, travel, food, and lodging. We are reaching out to our family and friends for financial assistance in continuing this exciting endeavor. 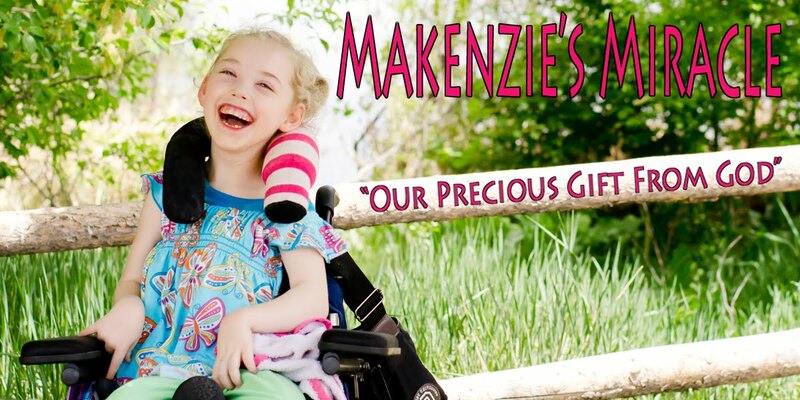 Please consider helping Makenzie realize her full potential. What better way to spend your afternoon then with all of the kids, grandma, plenty of junk food, the game of Life, and of course The Super Bowl! Go Saints! What a game! I was able to catch up a few things this evening. By tomorrow afternoon my house should be all put together and clean! After last week, it will be much needed. I am beginning to finish up a lot of the loose ends that have been hanging over my head lately but of course that list has been refilled with new things. Once again tomorrow is Monday and I again found myself saying, Wow, I don't have much to do tomorrow, but I am sure that will change 30 mins after I crawl out of bed! I do have a few phone calls to make and paper work to pull together. I have several e mails to write and at least one meeting to schedule. I have felt the weight of so many decisions in the past week. It is emotionally exhausting! Decisions that are not easy and are very important. Sometimes I just get plan tired of making them. They have been consuming my mind during the day and keep me up at night. I say I want a vacation but really no matter how far away I travel they will be lurking and ready to pounce on me the second I return. The big decision of tomorrow is whether or not Makenzie will be going to school. I am not sure I feel comfortable sending her until some of the issues I am having right now get resolved. Of course it is not a simple yes or no answer. Thanks for letting me vent! I am done! I know that God will carry me through and soon life will slow down and there will not be so many things to do. Smooth(er) waters are ahead! However, I would again like to ask for prayers for Triniti. As I complain about my seemingly tough decisions, I think about Meredith and the decisions that she has been making for the last 2 weeks. Triniti was doing well and today she had another bad day. She is on a lot of drugs to keep her asleep and still on an osculating ventilator to help her breath. Her CO2 levels are creeping up again. She has blood in her mucus and when they move her she destats. She is still VERY sick little girl and there is nothing more they can do but wait. Pray peace over this family as they continue to make very hard decisions! Pray for Triniti. Pray! The end to another week and another intensive ABM session. We had a long week. I have been very tired and overwhelmed this week for some reason but I made it! My boys are at Grandmas tonight and I am really thinking about just staying home and relaxing again tomorrow with Makenzie. I feel bad because that would be the second week I haven't made it to church. Part of me thinks it would be refreshing to go and part of me thinks it would just be nice to stay home after the week I have had. I guess only tomorrow will tell! Our week of ABM went very well. Makenzie continues to learn and grow and I am more excited then ever to go to CA in March! We managed to have 2 consults with Anat Baniel this week! The first one I got to sit in on and was very helpful in terms of what needs to happen for Makenzie to realize the full effects of ABM. The second Andrew had with Anat yesterday. He asked her to watch one of the videos that I took last week. He got some very good feed back from Anat. She was very impressed with his work with Makenzie. That is not all.... she was amazed by Makenzie as well! She told Andrew that Makenzie has so much potential...which of course I already knew...lol.. and that she felt like ABM could REALLY help her! Di I already mention that I am super excited to go to CA...oh yeah.. I did! Of course I realize that the above is just an opinion! I know that God is in complete control and that he is opening doors. It feels so good to hear some one talk about the Hope there is for Makenzie! After the conversation with the school district yesterday it was a much needed positive opinion! Anat Baniel shares the opinion of Hope for Makenzie with many others as well! Thank you to all who continue to believe in Makenzie! Thank you for the continued support, prayers, and kind words. Hope is what I hold onto! Today was a crazy day!! I still haven't sat down and it is after midnight! "Triniti is the most amazing little person I have ever known! She has totally turned the corner! She went from 100% oxygen and almost full vent support yesterday to 55% oxygen and lower settings today. She continues to improve and they are still weaning her down. The nurse and Dr. are surprised. I am too! I thought for ...sure we were going to lose her yesterday! I love you Trini!!!!!!!!!!!" YEAH GOD!!! Miracles happen everyday! So since it is late and I am tired I am going to let you see another taste of ABM and the amazing things Makenzie is doing! I told a friend last night that I had nothing going on today. I think my idea of nothing is a little off. Makenzie had PT this morning and did really well! She rolled on and off of her stomach well and got her hands up to push a few times fast then her PT or myself had ever seen! Go Makenzie! Lunch went great! Makenzie ate really well! I have been feeding her facing a mirror and she loves to watch herself eat! Well she loves to watch herself period but that is nothing new! LOL! Then we had our bi monthly check up with the nurse and got to tell her all about Makenzie's adventure to the hospital last week for her tube change. Loading up in the car was next on the list, time for Makenzie to go to school so Mommy could run some errands....oh wait ...school.... that would be so Makenzie can learn and be with her friends! LOL and so mommy can get some stuff done minus children! Then it was back to pick Makenzie up. Get the boys a snack, do homework, give baths, do Makenzie's hair, make formula, dose meds, talk to a friend, schedule a phone consult with an ortho doctor, and get Makenzie in bed! Makenzie did have a bit of time to play on the floor and she did great! She is moving SO much more!!! She is also doing a great job of following directions and using her voice to answer questions. This is what I found her doing in between all of our afternoon craziness! Then it was time to make the boys dinner while running up and down the stairs checking on Makenzie who didn't really think going to bed was a good plan. After I got the juice and dinner cleaned up there was a few minutes to sit with the boys to play Marvel cards and then off to bed for them too! I am sitting here looking at a pile of laundry that needs to be folded and put away but that will have to wait for another day and time! I AM DONE! NO MORE! I AM ON STRIKE until tomorrow morning that is! Mondays are the easiest day of my week and that in my mind is having nothing to do! Yikes! I think I need a vacation! LOL! Tomorrow we start our 3rd intensive ABM session! I am so excited! Are ya ready for us Andrew! A good friend of ours is also starting their first ABM intensive session tomorrow with their son Noah! Please pray for tons of healing for both Makenzie and Noah this week!